Aims: A low-cost medium for α-amylase is critical for the growing demands of industries. Method: In this study, α-amylase production was investigated using different agro-industrial products (wheat bran, cheese whey, soy bean cake, hazelnut oil cake) and supplemental nutrients (peptone, ammonium sulfate) using semi-solid substrate fermentation (SSSF). Observation: The experiments were planned in two stages. The first aim was to screen important nutrients for enzyme production using the Placket-Burman design. Result: Three components (wheat bran, cheese whey, and peptone) were determined to have an important effect on α-amylase production. The possibility of further optimization was examined by using the Central Composite Design. 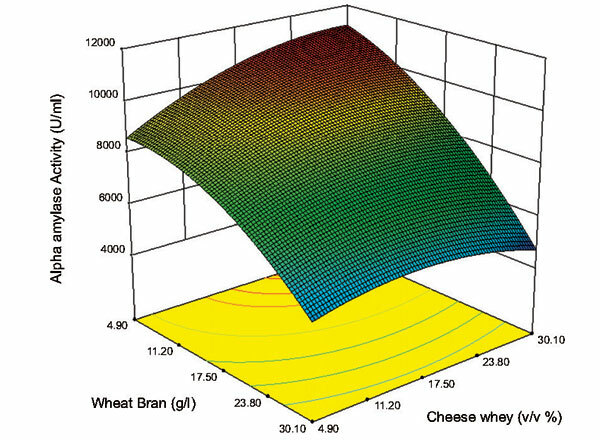 Conclusion: The maximum α-amylase activity was obtained (11,196 U/ml) using 4.9 g/l of wheat bran, 28.7 v/v% cheese whey, and 3.7 g/l of peptone. α-Amylase, semi-solid substrate fermentation, low-cost medium, response surface methodology, fermentation, culture broths.